“We invest in children, Jeff Sessions, we don’t tear them from their arms of their mothers and fathers,” Lt. Gov. Gavin Newsom told supporters in San Francisco on Tuesday night after winning 33.3 percent of the vote in the primary race for governor. I bounced between five public and private elementary and middle schools. I attended Redwood High School (a public high school) and Santa Clara University, graduating in 1989 with a B.A. in political science. Do you have a signature education program — for K-12 or higher education — that you want to see put in place? If we are serious about closing the achievement gap and income gap, we must get serious about closing the opportunity gap. That begins with education. As governor, I’m calling for the “California Promise,” a new way of thinking about education as a lifelong pursuit. Our role begins when babies are still in the womb and it doesn’t end until we’ve done all we can to prepare them for a quality job and successful career. I will realize this vision by expanding prenatal care, expanding affordable, high-quality child care, adopting universal pre-K, launching college savings accounts for every incoming kindergartener across the state, investing in K-12 community schools, increasing incentives to attract and retain high-quality teachers, launching a new higher education coordinating council to set bold statewide goals and holding institutions accountable to them, guaranteeing two years of free community college tuition and connecting our early childhood, K-12 and higher education data systems to improve student outcomes. Each of these initiatives represents my commitment to reinvesting in our cradle-to-career public education system. What is your position on making state-subsidized preschool or transitional kindergarten available to all 4-year-olds? As mayor of San Francisco, we implemented Preschool for All, and as governor, I’m committed to universal preschool, equipping all of California’s children with the tools to succeed when they start kindergarten. If you support expanding it, how would you fund it? This will be a major priority for me as governor, and I am committed to identifying the resources to ensure a robust early education system. In fact, I was very intentional as the chief proponent of Proposition 64 in 2016 that we set aside significant funds for early childhood education. Moreover, we need to incentivize and encourage cities, counties and regions to make early learning a priority and implement set-asides for early childhood and children’s services, modeled after the Children’s Fund we established in San Francisco. Do you support efforts to expand the state’s role in providing child care and other services to children in the 0-to-3 age group and their families? If so, what kinds of programs and services would you promote? While I’m a firm believer in universal preschool, I believe that beginning learning at 3 years old is already too late. We need to double-down on the readiness gap by emphasizing prenatal care and the first three years of a child’s life when nearly 85 percent of brain development occurs. To create a strong foundation of educational success, I believe we must expand proven programs that support the health and wellbeing of our state’s babies and their families, including prenatal and developmental screenings, family nurse visits and affordable, high-quality child care. Furthermore, our early childhood strategy must also include expanded family leave because a parent should never have to choose between keeping a job and taking care of their newborn child. Investment in the first three years pays off: students who participate in early education programs have been shown to have fewer interactions with the criminal justice system, achieve greater educational outcomes, and go on to have successful careers. The Local Control Funding Formula was Gov. Jerry Brown’s signature school funding program. Do you support its continuation? Are there any changes or fixes that you want to make to it? I applaud Gov. Brown for his leadership in emphasizing equity in our allocation of education resources. The Local Control Funding Formula made high-needs students a priority in policy, but the hard work of implementation to truly serve students’ diverse needs is still a struggle with limited resources. Adequate funding for our schools through Proposition 98 and successful implementation of LCFF’s accountability system are key next steps for our public education system. I will ensure that there is increased transparency and that the dollars are being spent on the students and districts they are intended to serve. Should local districts be given the power to reject charter schools if they determine that the charter has or will make an adverse financial impact on the district? I am a longtime supporter of nonprofit public charter schools as centers of education innovation, but believe, as taxpayer-funded institutions, they should meet basic standards of transparency and accountability. We do not want to empower local districts to use fiscal impact arguments as a way of otherwise blocking valid charter applications but in a difficult budgeting environment, ignoring significant fiscal impacts would not be prudent. I believe financial impact should, therefore, be a consideration, not a deciding factor. Education groups such as the California School Boards Association and the California State PTA want the Legislature to set a goal of raising base funding in the Local Control Funding Formula by 60 percent, from about $8,000 to about $12,800 per student, which would make total K-12 funding in California well above $12,156, the most recent national average. Do you agree? What forms of additional revenue would you favor to achieve this goal? If California wants to keep our mantle as the fifth-largest economy in the world, we need to reinvest in our economic engine — our cradle to career public education system. I will protect the integrity of Proposition 98 while ensuring that it is a floor, not a ceiling, and make new investment in our early childhood through public higher education systems a priority. As outlined earlier, I also believe Governor Brown’s Local Control Funding Formula and Local Control Accountability Plans must be continued, so we can ensure that funding is focused on students who need it most. Moreover, we need to empower local communities to control their own destiny and seek additional sources of revenue for public education. At the same time, I will seek to ensure that communities without the ability to pass these increases will not be shortchanged. What would be the single most effective way to address the teacher shortage affecting many school districts in California? Unlike U.S. Education Secretary Betsy DeVos, we will attract teachers, not attack teachers. Our state faces an acute teacher shortage, particularly in early education, special education, bilingual education and STEM. A full 75 percent of California’s school districts reported experiencing a teacher shortage last year. While this is a widespread problem, I understand that California communities with greater proportions of students of color and students living in poverty have been especially impacted by both shortages and high rates of teacher turnover. 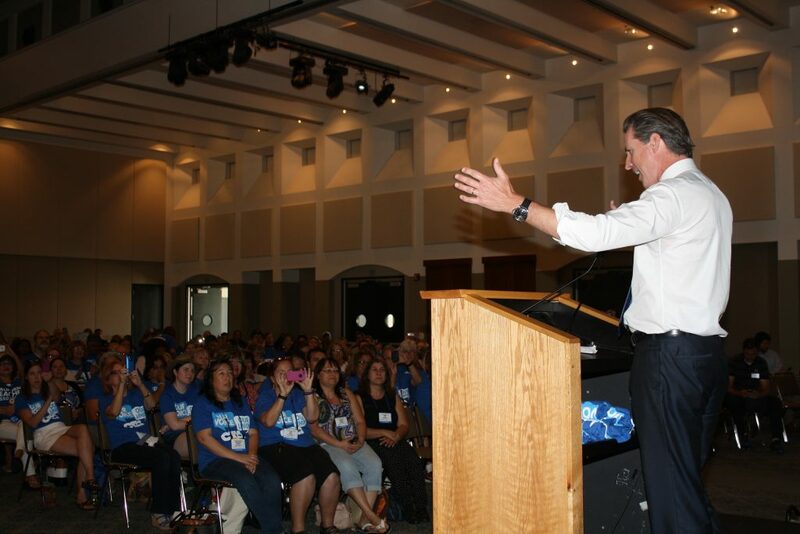 For California students to succeed, I understand we must keep quality teachers in the classroom. Educators deserve support for their own learning. I will invest in high-quality preparation for both teachers and principals, service scholarships to underwrite preparation for those who will become teachers in high-need fields, mentoring for all beginning teachers, and useful professional development — not the drive-by workshops or “spray and pray” approaches that most teachers have learned to dread. My plans provide incentives for schools to set aside time during the day for teachers to collaborate. My investments in teacher professional development and recognition — through vehicles like National Board Certification and the Instructional Leadership Corps, for example — will help the state develop a cadre of expert mentor teachers. Ensuring that teachers are involved in developing local school plans for improvement, building on their expertise and knowledge of what works, will move California schools and student learning forward. Will your first budget include any extra funding for the University of California and California State University systems to avoid further tuition hikes? My first budget will include a significant increase in funding for the UC and CSU systems to avoid further tuition hikes. It has been nothing less than devastating to watch the state’s disinvestment from public higher education, and with it, stripping a generation of Californians of an opportunity those before them enjoyed. State support was slashed by one-third after the Great Recession. We’re just now achieving pre-recession funding levels but we’re also educating thousands more students. We must do better. As lieutenant governor since 2011, I have had the unique privilege of serving as a University of California regent and California State University trustee, and am proud to have voted against every tuition hike over the past seven years. This year, I urged the UC and CSU systems to postpone yet another vote on tuition until the Legislature and governor had time to reach a budget agreement — I was pleased to see they took that step. Particularly at a time when California has achieved a $6.1 billion budget surplus, the state must invest significantly more in higher education, not place the burden on the backs of students and their families. What will your administration do to promote college affordability for all Californians? I have voted against every tuition increase, fought to solve the student debt crisis, and helped lead the charge for Promise Programs across the state, beginning with the San Francisco Promise we launched when I was mayor. I understand that once the total cost of attendance and all available financial aid is taken into account, it’s more expensive for a financially needy student to attend a community college than a UC or CSU campus. Non-tuition expenses like books, transportation and housing can make up 90 percent of the total cost of attendance. That’s why I advocated for legislation to expand the Cal Grant B Access Awards, supporting community college students with these costs. As governor, I will ensure high schools do all they can to make students aware of their financial aid options. I’ll ground all conversations about tuition and financial aid in the full cost of attendance to reflect the actual cost of postsecondary education. We’ll boost financial aid by increasing the amount of competitive Cal Grant awards and expanding award amounts, and we’ll offer two years of free community college tuition. I’m also alarmed by the staggering number of college students who confront food and housing insecurity. We’ll provide the resources necessary to address these crises. Moreover, 75 percent of serious brain illness manifests before age 25, meaning our college-aged youth are at particular risk. We’ll work to ensure every college adopts comprehensive strategies for raising awareness of symptoms of mental illness, identifying students at risk, and providing support services. Do you support Brown’s proposal to link some community college funding to student performance? Do you support applying the same notion of linking funding to student performance to the UC and CSU systems? I support the intent of Gov. Brown’s community college student success proposal, while also paying close attention to the suggestions being offered by the California Community Colleges Chancellor’s Office and various campuses. I do believe that the governor should be able to leverage state investments to incentivize the continued improvement of all our educational institutions. Research shows that linking funding to student performance and graduation rates as a piece of the overall higher education budget can be a powerful force in achieving our shared goals. What is your position on Brown’s proposal to establish an online community college to serve so-called “stranded workers” — older workers who lack the skills to advance in the workplace? We are living in a hinge moment — with globalization and technology detonating at the same time, displacing workers and entire industries. It’s not an easy subject to talk about, but we need to have a serious conversation about the future of work. If we don’t prepare ourselves, our rising levels of wealth and opportunity inequality will only widen. There is no silver bullet that will wholly solve the displacement from future technology, but implementing the right solutions can help ease the transition and protect the workers most vulnerable and susceptible to automation. While I support the spirit of Governor Brown’s proposal, I do share some of the concerns raised by faculty and students and look forward to continuing conversations about innovative ways to increase access to education and career opportunities. As governor, I will provide individual skills accounts for Californians looking for work so they can always refresh their skills, no matter what stage of life. In today’s rapidly changing economy, our workforce must be able to adapt to new needs and advancements. These accounts, established with the backing of business, labor and government, will allow Californians to tap into the vast resources of our community college system to help get folks back on their feet. As a retired LAUSD administrator I applaud your efforts.